“You propel yourself into the arms of god, and christ and all the angels”, remarks folky singer Emmy the Great on “Trellick Tower”. To be honest, it’s not exactly the first lyric that comes to mind when Notting Hill’s famous social housing block is under the spotlight. The colossal monument to Brutalist architecture reigns over the skies of the West London dwelling like an imperial giant. 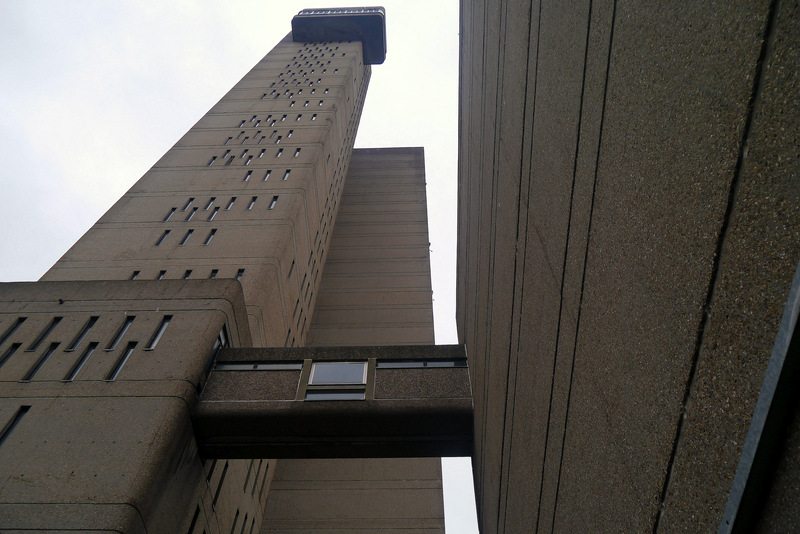 Trellick Tower is a remarkable building. A decadent of another era – one where it was acceptable to build housing without a consideration of its own functionality. Trellick’s residents live in what can only be described as an urban maze. For one, the defining service tower is no-doubt architecturally interesting, but rather purposeless. Moreover, my last visit saw me trapped at the top of a staircase outside and forced to make a humiliating U-turn back down the stairs. Although this occurrence could easily be construed as part of my own ignorance. Ernő Goldfinger’s structure would surely be rejected if in the planning stages today – especially from a council perspective. The maintenance, upkeep and security cost more than a fistful of dollars, especially after the 1980s saw it turn into a notorious crime hotspot with multiple rapes and assaults. Meanwhile, from an aesthetic viewpoint, witnessing 100 meters of concrete shoot up from the ground is enough to make anyone nauseous these days. So why praise it? Well, its ugliness translates into beauty. The Love London Council Housing blog gives a good explanation of the ‘retro cool’ phenomenon. My own personal feelings towards Trellick Tower hark back to my interests and youth. By taking a degree in Modern Eastern European History and Culture, social housing comes as part of the deal, and attachment forms around this. Indeed, on a recent trip to East Berlin, I was one of few in my group who openly admired the formality of such buildings – albeit it from an outsiders’ distance. Saying that, for much of my own existence, I grew up in high-rise council housing. Despite my open disdain for it, I also slightly miss the communality of living in a block with numerous families inside. At a time when ‘affordable housing’ has quickly become the new slang, and council housing continues its slump into history, Trellick reminds us of the big ideas we had for society in the pre-war period. Such buildings came after a national conversation about what type of country we wanted to live in. The UK chose a welfare society back then – a fact quickly ‘forgotten’ by subsequent Labour and Conservative governments. Ken Loach’s recent documentary The Spirit of ‘45 reminds us of this debate. But to return to where we began. Emmy the Great’s track “Trellick Tower”, apart from being an all-round joy, understands the brilliance of this beast in the same way as me. Recognising the tower’s soul and purpose, her song harnesses the building as a reference for the theme of lost love, ambition and heartache in a bare and stripped back manner. It’s attempt to make sense of things which have past can be taken as a socio-political message as much as a romantic one; “Can I spend my life trying to climb you?” The residents of the tower have historically been immigrants, descendants of immigrants, and poor – despite the recent supposed influx of hipsters. The opportunities of scaling to the top of the tower for them is – for the most part – purely literal rather than metaphorical. Yet in this instance, that’s not for the best. “Trellick Tower” yields from Emmy the Great’s 2011 album Virtue. Also take note of her short film for “God of Loneliness”, featuring an always delightful Isy Suttie and the tower in an integral role. Imagine that lift actually not working! I can only urge everyone and anyone to visit Trellick Tower if you get the chance. I guarantee it’ll put your life in perspective.